HipHomeschool Moms Blog did a review of our material and website. Click here to read about it on their website. The Homeschool Classroom reviewed Sight and Sound Reading – Fabulous and Free Reading program! Click here to read their wonderful review. We LOVE your site! It has made my son excited about being able to read each page. At the end of the day, he takes his worksheet around reading it to everyone he sees! His speech therapists is also now recommending it to her other clients who are struggling readers. He always takes his worksheet to speech to read for his ST. I just received my sight and sound reading pack in the mail today! It is amazing, so much stuff to do with it! Thank you very much! We finished Day 2 yesterday, and he’s gaining so much confidence, which is amazing to see because he previously had such a bad self concept about reading. We’re looking forward to Day 3 this afternoon. It’s really amazing that since he Skypes with Grandma regularly, he is seeing your mom as a live teacher instead of a video. She is really engaging him, and we have already started talking about how much he likes his reading teacher, Mrs. Karle…. …This is the first time that he’s taken to a reading program without some type of struggle. I did take your advice, though…when he seemed overwhelmed by practice, we skipped a day of new material and just reviewed what he’d already completed, but he’s excited to get back on track today with Day 7! I love the circling the worksheet practice because he has had some fine motor delays, so it’s fantastic that he’s practicing those while learning how to read!!! I’m positive that it has been working with this program that gave him the confidence to read a book by himself for the first time over the weekend! …My son is 6 years old and just about to finish kindergarten. The difference between what has been happening in kindergarten and what is happening with your program is the focus on what he CAN do. In school the focus was on phonics and only phonics for so long that we were all concerned about his ability to learn, so we had him tested, and he’s gifted, but weak in the area of phonemic awareness (so the first 6 months of kindergarten focused solely on what’s he can’t do well yet). He also has sensory processing disorder, ADHD and PDD-NOS, so the 15 minute lessons are perfect to help him be successful at focusing the whole time as well as building his confidence. I had decided to start at the beginning of the program instead of in the middle because his confidence was so low, but last night he read day 6 to us with the new word with such pride before we even got started with the lesson. Since he’s sort of bursting with reading abilities now that negative self concept isn’t in the way, I’m planning on letting him set pace a little more, as long as he keeps circling new words and reading old ones as we go. He’s starting to accurately read words on signs and books that he’s heard before, and is no longer scared to try, and I attribute this to Mrs. Karle!!! …What is also really helpful about how Mrs. Karle teaches, especially for a kid with ADHD, is the focus on slowing down. For example, when he read the book in the picture I sent you, I had to ask him if the word “the” is in between “and” and “little” nearly every time he read it since he was assuming it was there because he was moving too fast. Being able to follow that up with the methodical approach with which Mrs. Karle points at each word, comma or period helped him to see that it’s okay to slow down for accuracy…if Mrs. Karle does it, then it must be okay! And his breaths for commas are precious. …I received confirmation from his paraprofessional today that the improvement he has made since he started the program has been phenomenal. For most of this school year, the time she has spent with him has been to help him keep up with work in class. As of this week, she reports that he is now completing work on his own, and when she comes in, he proudly shows her what he has accomplished, and she even saw him helping another student with math today. Prior to this program, he didn’t have the confidence to see outside of “I can’t”, so to hear that he not only felt “I can”, but saw outside enough to see a friend struggling and offered assistance is amazing. His dad volunteered in class today, and reported that he read him four books today, back to back, beaming with pride, all by himself. Thanks again for making this progress possible!!! Thanks again for making this program available on the internet for free. There are so many choices out there, and some are so expensive, and we wanted to be sure we couldn’t do it on our own before we send him to a reading specialist (as has been suggested), and I believe that this is exactly the tool we need to help him learn. I can’t thank you enough. We are all feeling more confident about his ability to keep up in school thanks to this program. 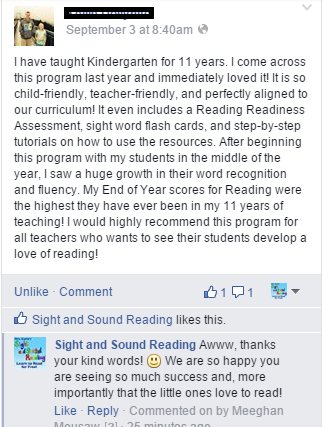 Several excerpts from a conversation with a teacher (Ms. D) who used Sight and Sound Reading in her classroom. …I am writing to provide my whole-hearted endorsement of Madreen Karle’s reading program. When I started teaching 1st grade, my school had few resources available for me to use in teaching reading to my class of low ability 1st graders… I turned to Madreen for help, as she had been teaching 1st grade reading for years and I knew she had a wealth of resources. The help Madreen provided was invaluable, both in terms of the materials she shared with me and in terms of the mentoring she provided. Her knowledge of how students best learn and what sorts of activities most support and motivate them was unparalleled. …One of the most helpful activities Madreen provided me with was her reading program. The reading selections started out very simply, with very few words, so that students could experience success with the selection Day by day new words were added to the reading selections, no more than one or two new words a dayso that students could slowly expand their reading vocabularies. Each morning, I began reading class by having the students read the new selection. I would first introduce any new words, circle them, and talk about their phonetic structure. I would then read the selection out loud to the students,while pointing to each word. I would read it again, encouraging the students to .read it with me. Next, I would give my pointer to a student volunteer, who would come up and point to the words as the students read the selection chorally several more times. Finally, I would ask individual students if they wanted to try reading the selection by themselves This gave every student in my class the opportunity to participate and build self-confidence. …When the students went back to their desks, they were given a copy of the (reading) to practice reading independently. As they read through it, they circled each word that they already knew, allowing them (and me) to see how many words they were capable of reading all by themselves. This was a wonderful way to build self-esteem, especially for those students who, because of a learning disability or other factor, were not always confident of their reading ability. Students then practiced reading the selection aloud to me. This time was important in my evaluation of student progress, as I could see if students were mastering the concepts of print and if their sight word vocabularies were developing appropriately. Remarkably, even though we accomplished so much during the reading class time, we rarely spent more than 15 minutes of class time each day. The students did get additional practice however, as they took home their (handouts) to be read as homework. Parents knew to expect the (story) each night, and would ask their children to practice reading it to them. In this way, students got much-needed practice, reading the same words over and over, so that the new words would become part of their sight word vocabulary. …I liked using (Mrs. Karle’s program) for three main reasons. First of all, the students really loved them. They looked forward to reading class, because they knew (how) we would start each class. They loved reading the new (story) each day, and looked eagerly to see what new words had been added. This was a confidence builder for my students-there were so many words they already knew, so they really felt like readers. The (reading) allowed all of my students to experience success, something that they didn ‘t always get to experience in their other academic pursuits. …Secondly, parents really loved the (program) as well. It was something they knew was coming home with their children every night, and it was a way for them to keep track of their children’s progress. They, too, got to experience their children’s success, and see their children really reading. At the end of each school year, many parents would come by to thank me for working with their children and making such a difference in their reading progress. Like me, they believed strongly that (Mrs. Karle’s program was) a big part of their children’s success. …Finally, I loved using (Mrs. Karle’s program) because they really worked in developing students’ reading abilities. In addition to providing much-needed exposure to important sight words, they also provided the opportunity to analyze words and their phonetic structures. Every day when we looked at the new words, we would compare them to other words the students had seen before. I would ask students to tell me if any words they already knew looked like the new word or possibly rhymed with it. We would investigate the beginning and ending sounds of the word and we would look at the vowels. Every introduction of a new word allowed for a short, but important. phonics lesson and the wonderful thing was that these phonics lessons were not random and decontextualized but rather were introduced in the context of a whole reading selection. The bottom line was that each year I taught first grade reading, my students progressed well beyond expectations. While all of them started the year below their peers in terms of reading readiness, by the end of the year most of them had caught up with, or even exceeded, their peers in other classes. I really do believe that (Mrs. Karle’s program) had a lot to do with this. …I am so glad that Madreen has decided to design and market a reading program. Her help and ideas proved invaluable to me in my work as a first grade teacher, and I firmly believe that they will also help other teachers in search of a way to best help their first grade students.